After an early breakfast in Arusha, drive to Machame Gate where you will meet the Buffalo Tours porters, guides, and cooks that will spend the next six days trekking with you to Uhuru Peak, the roof of Africa. The drive through coffee farms and villages to Machame Gate takes approximately two hours. The road is paved for most of the way with the last thirty minutes on a 4WD track. Once you arrive, you'll spend about an hour waiting at the gate while Buffalo Tours registers your climb and the porters and guides make final preparations. At around 10am, you will begin hiking with your guides to Machame Camp, the destination for your first day of hiking. The porters and cooks walk ahead of the group to set up the camp in time for your arrival. For the first three kilometers you'll hike along a 4WD track that passes through the moss-covered trees of Kilimanjaro's cloud forest. You will then reach a signpost that marks the beginning of the mountain trail and the end of the 4WD track. The narrow trail is steeper and more slippery than the 4WD track and you will want to have your walking sticks with you. Continue on through the cloud forest for another 1.5 hours until you reach a clearing where you will break and eat lunch. After lunch, you will hike through the cloud forest for another hour before leaving the forest for the scrubland. As the forest thins, the vegetation will change to include heathers, tall grasses and many species of wildflowers. If the weather is clear you will also be able to see some views of the surrounding area and your ultimate destination, Kibo Peak. Continue on for another half an hour before reaching Machame Camp for hot tea and snacks. Although considered to be the easiest day on the Machame Route, the route includes several strenuous uphill sections. You will be walking through exposed heather and moorland. Carry plenty of drinking water, as the hike can be quite hot on a clear day. During this section of the trail there are several viewpoints from which you can see the plains and forests below and Kibo and Mawenzi peaks above. As you gain altitude, the vegetation changes: The trees diminish in size, giving way to Kilimanjaro's famous high altitude plants, Scenecio kilimanjari and Lobelia deckenii. After eating lunch, you will climb the Shira Plateau, created when Kibo's lava flows filled up the Shira crater. Continue for another thirty minutes to Shira Camp, where you will relax for the rest of the day. Although this up and down day ends with an elevation gain of only 110 meters, by early afternoon you will have climbed 690 meters to a height of 4,530 meters before beginning your descent to Barranco Camp. Although the route is somewhat frustrating, this day is crucial for acclimatization. After breakfast, continue east on the Shira Plateau for two hours before reaching the junction for Shira and Lemosho Routes. Continue on through the barren landscape for another half an hour before stopping for lunch. Shortly after lunch you will reach the highest point of the day before descending quickly to Barranco Camp. From the high point, you can see Lava Tower, a 300-foot lava formation jutting out of the mountainside. 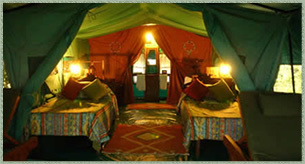 Barranco Camp is considered to be the most scenic campsite on the Machame Route. From the campsite you will see magnificent views of Mount Meru, Heim Glacier and Kibo's southern face. Leave Barranco Hut after an early breakfast to begin the long hike to Barafu Camp. The day begins with an hour and a half scramble up the Barranco Wall. This is the hardest part of the day and in some places you will have to use your hands to pull your body up. After reaching the top, you will make a short descent into the greener Karanga Valley before continuing on to Barafu Camp. On the way to Barafu you will see several of Kibo's glaciers as well as the junction that connects our descent route, the Mweka trail, with the Machame trail. During day four you will hike by the Heim, Kersten and Decken Glaciers. Although the way to Barafu is bleak, alpine desert with little vegetation, Barafu Camp offers stunning views of Kibo and Mawenzi peaks, and Rebmann Glacier. Try to sleep as soon as you finish dinner as you will be waking up at midnight for your summit hike. At midnight you will begin your ascent to Uhuru Peak, the highest point in Africa. For the next six hours, you will hike by flashlight. It is helpful to use a headlamp so your arms are free during the ascent. The Machame ascent to the crater rim is the most challenging part of the entire six-day trek. For much of the hike you will walk on a gravel slope that causes you to slip back slightly with every step forward. The going is extremely slow until you reach the crater rim at Stella Point. The hike from Stella Point to Uhuru Peak is a gradual climb and, as far as hikes go, not very difficult. The altitude, however, makes the hike a psychological battle, and you will need to go very slowly to reach the top. The guide will advise you on how to make the hike easier. The crater rim hike takes about forty-five minutes and you should reach Uhuru Peak around sunrise. Take photos of your guide and group at the peak before beginning the long descent to Mweka Camp. On the way down from Uhuru you will enjoy breathtaking views of the mountain, crater, glaciers and Tanzania. If it is a cloudy day, you will still have the luxury of the gorgeous views of the clouds below. At Barafu Camp, eat breakfast, drink lots of tea and take a short break. You still have another three hours to go before reaching Mweka Camp, day five's destination. After breakfast you'll finish the trek with a descent to Mweka Gate. Your last hike on Kilimanjaro is a beautiful one, passing through the enormous trees of the cloud forest. Watch your step during the descent, as the trail can be extremely slippery. Buffalo Tours Land Rovers will be waiting at the lower station of Mweka Gate to take you back to Arusha. You will be able to buy t-shirts and sodas at the gate.